Microscope digital cameras are defined as a digital camera which is used by a microscope to visualization and characterization of the biological activities under the microscope. Microscope digital cameras are integrated with advanced technology to provide researchers a wide spectrum of detectors to address their scientific needs. The global microscope digital cameras market is expected to grow at a CAGR of 9.5% over the forecast period i.e. 2017-2024. Moreover, the global microscope digital cameras market is projected to account for noteworthy sales by 2024. 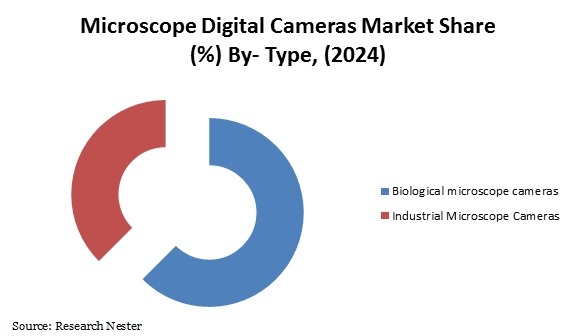 Further, rising healthcare expenditure, growing number of research activities and favorable government support are some of the major factors propelling the growth of microscope digital camera market all across the globe. The global microscope digital cameras market is segmented into type, mount type, sensor type, end user and region. Additionally, the end user segment is further sub-segmented into hospitals, research laboratories, pharmaceutical and biotechnology industries and clinics out of which research laboratories is believed to register a phenomenal CAGR by the end of 2024. Apart from this, biological microscope cameras segment by product accounted for the biggest market of overall microscope digital cameras market and is envisioned to capture significant CAGR over the forecast period owing to rapidly evolving biomedicine and pharmaceutical industry. In terms of geography, North America is projected to lead the market of microscope digital cameras during the forecast period aided by U.S. In addition to this, presence of major key players in this region is projected to foster the growth of microscope digital cameras market. Moreover, rising research and development activities related to imaging diagnostic products is also believed to impel to the growth of microscope digital cameras market. Europe region captured the second largest market of microscope digital cameras in terms of revenue in 2016. Further, Western Europe countries such as U.K., Germany and others are believed to be the major countries witnessing the augmented demand for microscope digital cameras owing rising government initiatives. Factors such as growing laboratory automation and technologically advancements in microscope digital cameras are expected to be the dynamic factor behind the rapid growth of microscope digital cameras across the globe. Moreover, rising adoption of advanced imaging diagnostic products for the treatment is projected to flourish the growth of microscope digital cameras market by the end of 2024. Furthermore, positive GDP figures along with increasing initiatives taken by government for the development of healthcare infrastructure in developing nations such as China, India, Malaysia and other countries is envisioned to bolster the growth of microscope digital cameras market. Additionally, advent of digitalization in the life science research is also predicted to foster the growth of microscope digital cameras market. Moreover, wide scale usage of microscope digital cameras for the diagnosis of hair and skin by audiologists and cosmetologist is also predicted to foster the growth of microscope digital cameras market. However, high cost associated with microscope digital cameras is expected to hinder the growth of microscope digital cameras market during the forecast period.